The international waste trade watchdog Basel Action Network (BAN) and their Philippines-based affiliate organization BAN Toxics strongly condemned the Canadian government today for violating the Basel Convention by refusing to repatriate more than 50 40-foot intermodal containers, each filled with household trash that were illegally exported from Canada almost two years ago. Despite many requests by the Philippine government to return the waste as is required under international law, Canada is charged by the environmentalists with bullying the Philippines into finally accepting the waste. Now, after more than 650 days, and Canada refusing to act, the Philippines Department of Environment and Natural Resources (DENR) announced yesterday that they would bury the wastes in a local landfill. Yet the United Nations Basel Convention, which Canada ratified in 1992, clearly defines household waste as “Other Waste,” listed in Annex II, which must be properly consented to by the receiving country prior to export. This consent, the Philippines government noted, never happened. As such, the export is illegal traffic according to the Convention. The Convention obliges Canada to return the waste to Canada unless impracticable. 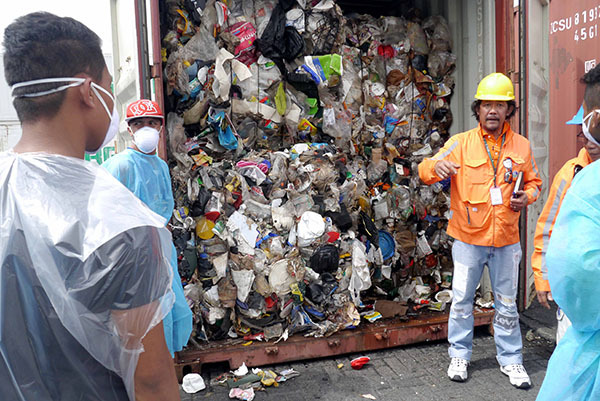 Since the waste has not been dispersed, its return can hardly be deemed any more “impracticable,” according to BAN, than the original shipment. BAN and Ban Toxics had earlier written a letter to the Canadian government in February 2015 outlining Canada’s legal obligations. Insiders within the Philippines government have inferred that the Philippines finally backed down because they need Canadian assistance on a border dispute with China and on immigration issues for Philippine nationals. Environmental groups accuse Canada of using their international clout to bully the Philippines. “The Harper administration in Canada is reneging on its international commitments and using its economic power to bend the resolve of a poorer nation from enforcing the very international agreement designed to protect it,” explained Attorney Richard Gutierrez, international environmental law expert and Executive Director of BAN Toxics. An international coalition of organizations has lodged an online petition and has collected over 25,000 signatures, with more than half from Canada. The group is encouraging more people to sign this urgent appeal to the Canadian government to follow international law and take legal responsibility for the waste before it is buried in the Philippines – a country that should not have to bear the burden.